Ozone replacement pigtails for a 4-line kite. 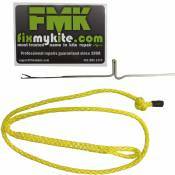 These pigtails connect to the bridle lines coming off the kite and allow you to hook up your flying lines. *Pro Tip - Don't forget to always check kite's pigtails for wear and tear. Set includes two loop-loop pigtails and two loop-3-knot pigtails.